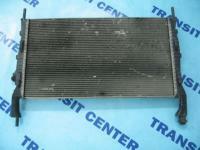 Ford Transit MK7 model cooling system, those are all elements like radiators, hose, coolant reservoir and cooling fans. Ford Transit MK7 model cooling system, those are all elements like radiators, hose, coolant reservoir and cooling fans. The department of the cooling system for Ford Transit MK7 model from 2006 to 2013 also includes parts as for example many types of cooling fan, the heater hoses, the thermostats and others as well important products. Most of them are responsible for taking care of removing heat from the engine to outside. In our offer you may find the using components and new ones. Caring about a good temperature of the engine is very important process. On the other hand the low temperature is inadvisable during the work of the engine. The reason of this are the increased emission of harmful substances. In case of damage, there is a possibility to effect to engine overheating or blurring, which the consistency is the immobilization. It's worth to regularly check the state of our cooling system to prevent some breakdowns. As everyone knows, those are connected with bearing of high costs. That’s why we encourage to visit our internet shop, where you can buy searching elements to your transit vans. The shopping's price list can be found on our website. As much as possible we persuade you to take it individually. Our headquarters is located in Pędzewo. Anyway, you always may contact with us by e-mail.